TORONTO, ON / ACCESSWIRE / April 8, 2019 / Rupert Resources Ltd ("Rupert" or "the Company") is pleased to provide an update on exploration activites at the Pahtavaara Project in the Central Lapland Greenstone Belt of Northern Finland. The Pahtavaara Project comprises a 290km2 contiguous land package and the permitted Pahtavaara mine with an inferred resource of 474kozs and a 1,400tpd mill and tailings facility. James Withall, CEO of Rupert Resources commented "The drill results reported today build on the geological modelling and underground sampling work undertaken in 2018 and demonstrate the potential for additional resources to be defined at the Pahtavaara deposit. The zones discussed are all near to surface and close to existing infrastructure. The combination of improved understanding of controls on mineralisation at the mine and continuing exciting results from our regional exploration give confidence to our approach to unlock the potential of this prospective region." Following Rupert's reappraisal of historical drill data resulting in a new geological model, a limited drilling program totalling 3,128m was undertaken in late 2018 and early 2019 to identify near-surface extensions of known mineralisation in the Pahtavaara mine. 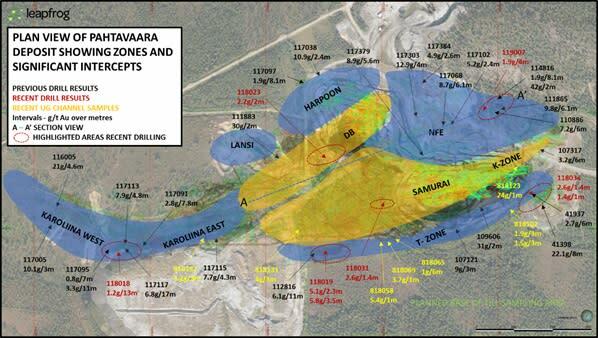 The 2018 structural work identified that the bulk of mineralisation (474koz of existing Inferred Resources plus 441koz of depleted resources mined by previous operators) at Pahtavaara was hosted in two plunging zones, Samurai and DB controlled by the intersection of north west and east-north- east structural features. 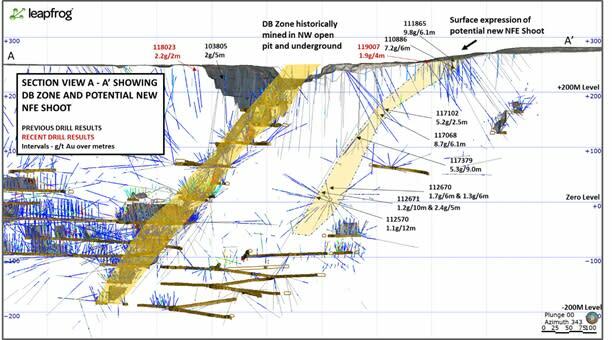 This recent drilling demonstrates the potential for further mineralised plunging shoots in the NFE zone (see Figure 1) that come to surface and show continuity at depth along with further near surface mineralisation in close proximity to the North West ("NW") and Main open pits. Further to this, limited drilling at Karoliina West and in the T zone structure showed that mineralisation is open to towards the surface. Samples are prepared by ALS Finland in Sodankylä and assayed in ALS laboratory in Ireland. All samples are under watch from the drill site to the storage facility. Samples are assayed using fire assay method with aqua regia digest and analysis by AAS for gold. Over limit analysis for >10 ppm Au is conducted using fire assay and gravimetric finish. For multi-element assays Ultra Trace Level Method by HF-HNO3-HClO4 acid digestion, HCl leach and a combination of ICP-MS and ICP-AES is used. The Company's QA/QC program includes the regular insertion of blanks and standards into the sample shipments, as well as instructions for duplication. Standards, blanks and duplicates are inserted at appropriate intervals. Approximately five percent (5%) of the pulps and rejects are sent for check assaying at a second lab. Base of till samples are prepared in ALS Sodankylä by dry-sieving method prep-41, and assayed by fire assay with ICP-AES finish for gold. Multi-elements are assayed in ALS laboratories in either of Ireland, Romania or Sweden by aqua regia with ICP-MS finish. Rupert maintains a strict chain of custody procedure to manage the handling of all samples. The Company's QA/QC program includes the regular insertion of blanks and standards into the sample shipments, as well as instructions for duplication. Rupert is a Canadian based gold exploration and development company that is listed on the TSX Venture Exchange under the symbol "RUP". The Company owns the Pahtavaara gold mine, mill, and exploration permits and concessions located in the Central Lapland Greenstone Belt in Northern Finland ("Pahtavaara"). Pahtavaara has an Inferred mineral resource at a 1.5 g/t Au cut-off grade of 4.6 Mt at a grade of 3.2 g/t Au (474 koz) (see the technical report entitled "NI 43-101 Technical Report: Pahtavaara Project, Finland" with an effective date of April 16, 2018, prepared by Brian Wolfe, Principal Consultant, International Resource Solutions Pty Ltd., an independent qualified person under National Instrument 43-101 – Standards of Disclosure for Mineral Projects). The Company also holds a 100% interest in two properties in Central Finland - Hirsikangas and Osikonmaki; the Gold Centre property, which consists of mineral claims located in the Balmer Township, Red Lake, Ontario; and the Surf Inlet Property in British Columbia. This press release contains statements which, other than statements of historical fact constitute "forward-looking statements" within the meaning of applicable securities laws, including statements with respect to: results of exploration activities, mineral resources. The words "may", "would", "could", "will", "intend", "plan", "anticipate", "believe", "estimate", "expect" and similar expressions, as they relate to the Company, are intended to identify such forward-looking statements. Investors are cautioned that forward-looking statements are based on the opinions, assumptions and estimates of management considered reasonable at the date the statements are made, and are inherently subject to a variety of risks and uncertainties and other known and unknown factors that could cause actual events or results to differ materially from those projected in the forward-looking statements. These factors include the general risks of the mining industry, as well as those risk factors discussed or referred to in the Company's annual Management's Discussion and Analysis for the year ended February 28, 2018 available at www.sedar.com. Should one or more of these risks or uncertainties materialize, or should assumptions underlying the forward-looking statements prove incorrect, actual results may vary materially from those described herein as intended, planned, anticipated, believed, estimated or expected. Although the Company has attempted to identify important factors that could cause actual actions, events or results to differ materially from those described in forward-looking information, there may be other factors that cause actions, events or results not to be as anticipated, estimated or intended. There can be no assurance that such information will prove to be accurate as actual results and future events could differ materially from those anticipated in such statements. The Company does not intend, and does not assume any obligation, to update these forward-looking statements except as otherwise required by applicable law.